Late Wednesday afternoon we checked into Sleepzone. The room for the night cost 1 Euro each, or the equivalent of $1.36 Canadian. Sadly, I paid significantly more for parking that night. attending a semester at the University of Economics, Prague, Czech Republic. He flew from Sweden to meet us and join our travels. We were recommended this little restaurant by a local. It certainly did not disappoint. 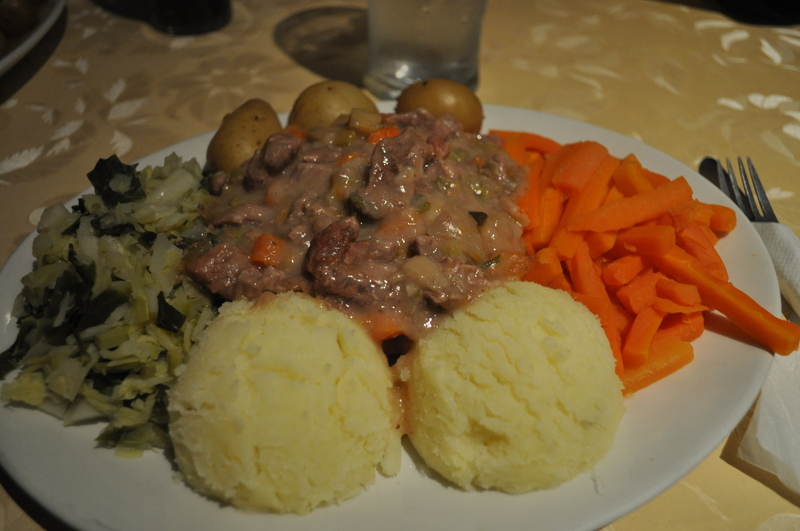 The order was a plate of Traditional Irish Stew with Veg (potatoes (whole and mashed), carrots and cabbage/green vegetables. A hungry man’s portion indeed. 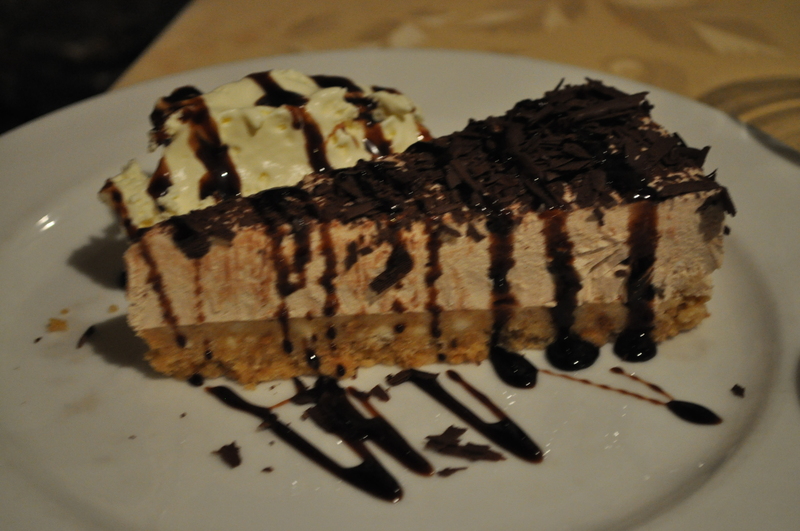 After filling up on the main course, we treated ourselves to a dessert of Bailey’s Cheesecake. I highly recommend the cheesecake, as the perfect way to end a great Irish meal. Food in Ireland, like Newfoundland and Labrador would tease and tantalize the taste buds. We left the restaurant very satisfied. Despite the rain, we decided to walk the streets and find a good pint and some music at the pubs. 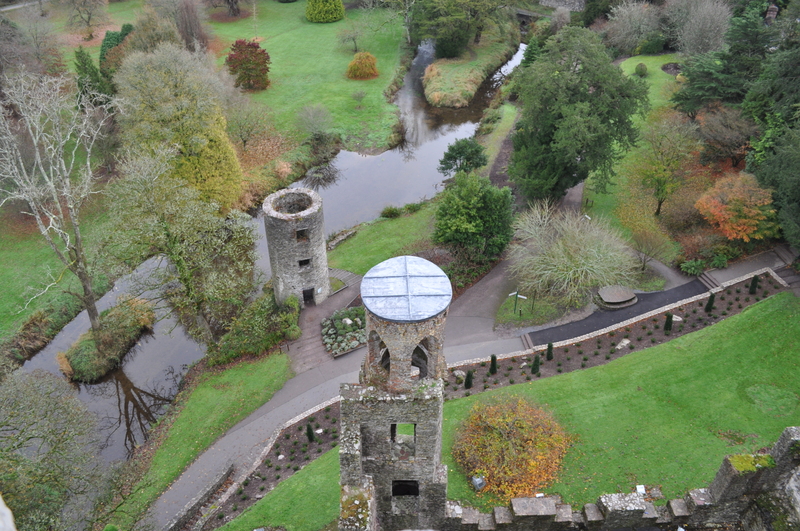 An early rise on Tuesday led us to Blarney. 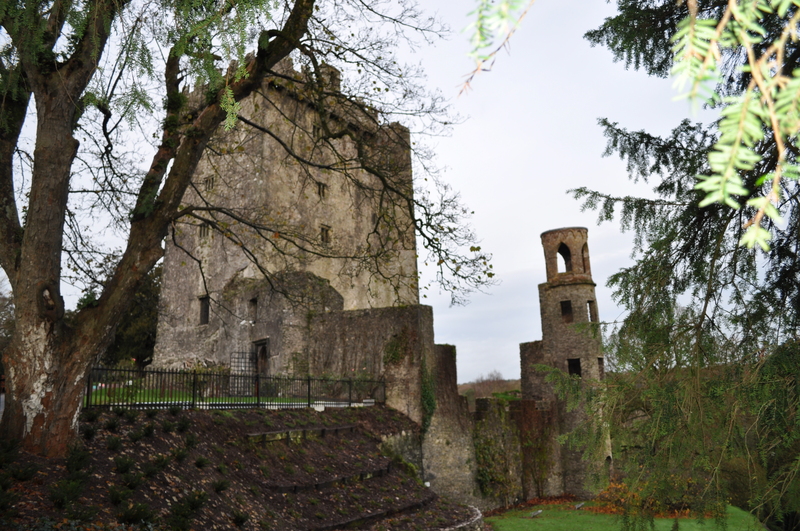 We walked around the Town, seeing a bird sanctuary, churches, Blarney Mills Shopping Center and of course Blarney Castle. The morning was crisp, but the walkways were “just beautiful”, as Mom would often state. The flowers, trees and water views were pretty impressive en route to the castle. 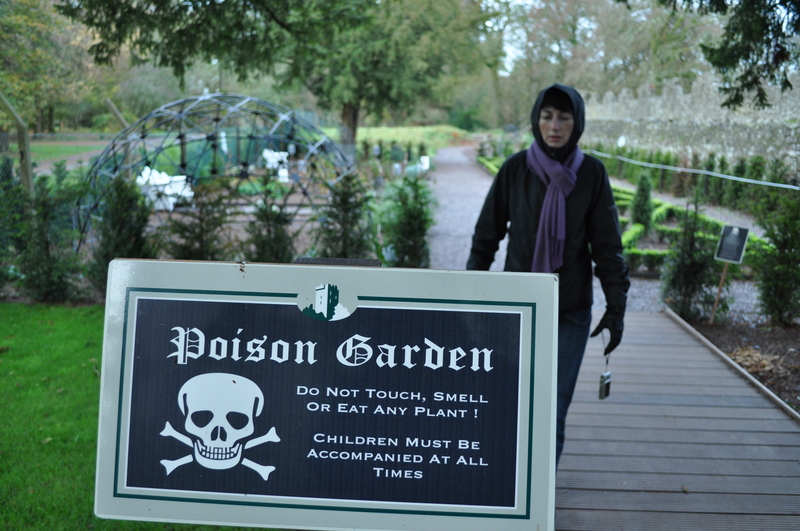 Mom braves the Poison Garden as we wait for the castle to open for viewing. It was interesting to learn about the different herbs and plants that are dangerous when consumed or if one comes in direct contact. I thought this was a nice value-added feature of this tourist attraction. I kissed the Blarney Stone! Blarney: Is when you ask a women how old she is, because you want to know what age women are most beautiful. 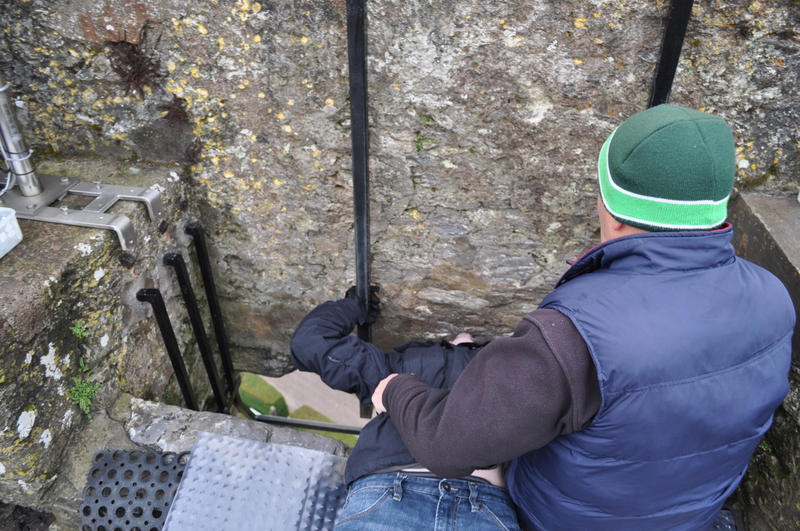 Kissing the blarney stone, apparently gives you the gift of eloquence. In fact, Winston Churchill kissed the blarney stone and was an outstanding orator. I kissed the Blarney Stone. Now, I have ensured to have the gift of gab, if I had not previously mastered it. Imagine the droves of people that come from all over the world each year to kiss this stone. Take the time to enjoy the views, castle and surrounding gardens. 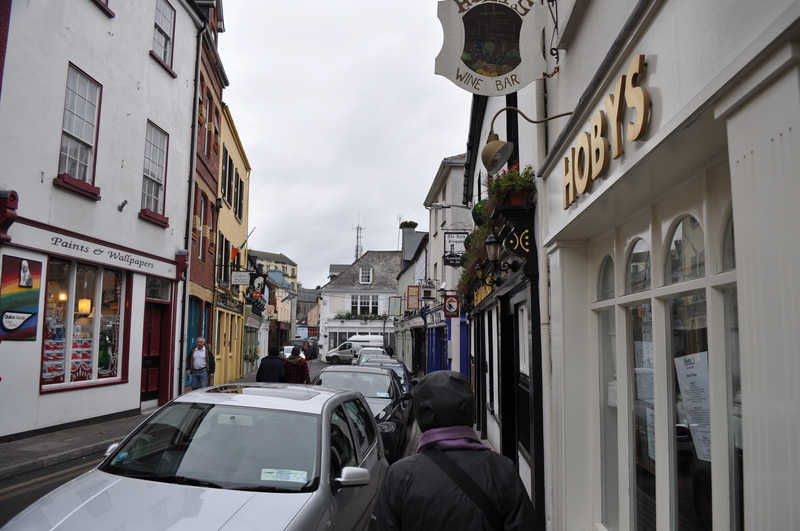 After a great meal in Culinary Cork, we walked the streets enjoying the shops, buildings and of course the pub culture. 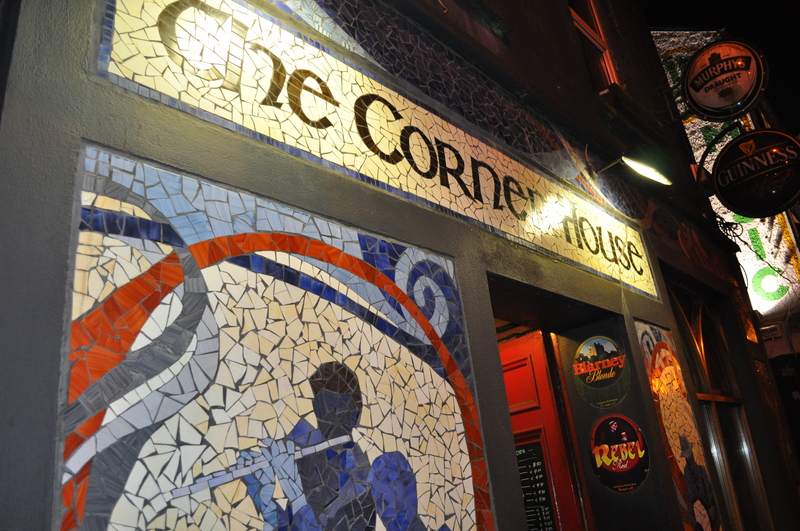 The Corner House was recommended by a local to have a more a very relaxed experience in the company of locals. The outside tile, creates an colourful invitation of music and artistic talent as one walks into this classic pub. The walls are papered with postcards, bills in many currencies and of varying demoninations. Your curiousities come to life as your eyes run rapid from ceiling to wall. Enjoying a Pint of Beamish! The bartender was quite the chap. He ran a good operation and told us a few stories, as he poured me up a pint of Beamish on a Monday night. This was my Mom’s first night in Ireland and we christened it with local beer in a quiet pub lots of locals dropping in an out for a pint. There were many conversations to be had by all. Good music, good grub, good company and good drink in a comfortable space. It is time for Rural Newfoundland & Labrador to embrace pub culture. 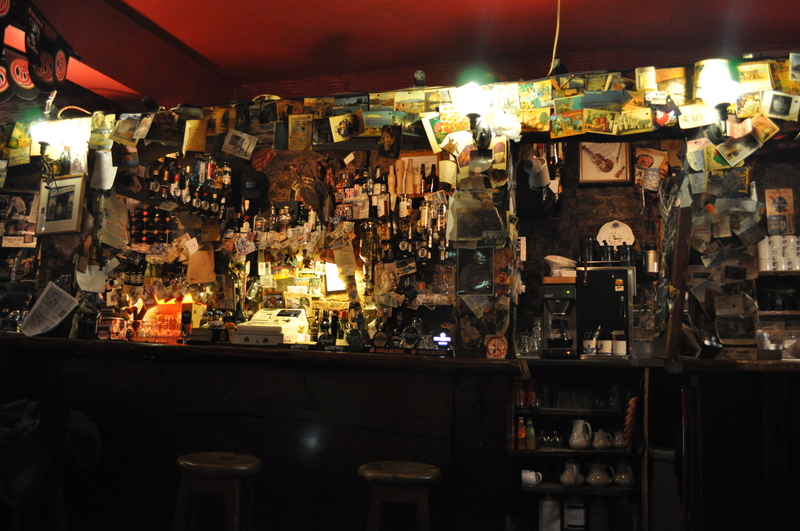 Pubs feel like a local kitchen party, once a common past-time. The local lounge, club and bar should consider adapting to be more generationally friendly, especially with a rural aging population. Make the pub a social commons, a meeting place to connect communities across generations, sharing stories of today, yesterday and tomorrow. 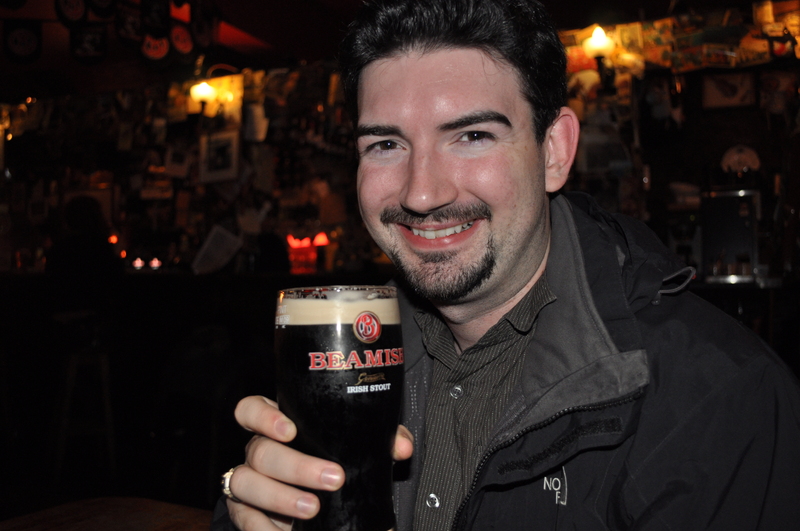 I visited Ireland in 2007. 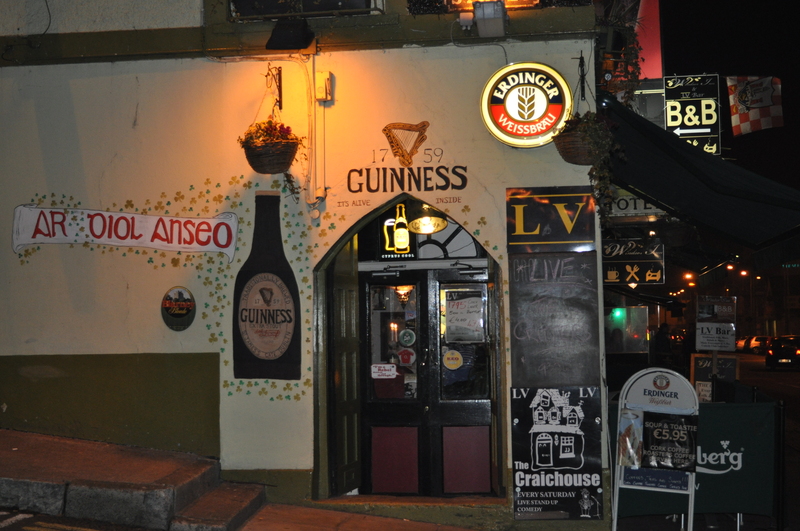 We celebrated St. Patrick’s Day in Dublin with local Irish men. This happened because the week before Jen and I were in Stockholm, Sweden and starting talking to them in the street. I am glad she did, because we had a truly authentic Irish Paddy’s Day experience with the kitchen party at an Irish residence, to whirly burgers and more. Thank you James, Elmo and others. Jen & I will never forget the times at McGowens. We returned again in April, after missing our cheap flights with both of us over sleeping; as we all celebrated the end of the semester the night before. This resulted in us taking multiple trains, underground, bus, ferry, shuttle and tram. We travelled from England to Wales to Ireland to dock in Dublin, Ireland 12 hours later than expected, but we made it. My final visit to the island was in December 2007 when I flew to Edinburgh alone prior to Christmas. There I met the Dodgemeister and a Swedish Princess. After a couple of days I took the train to Glasgow and the ferry to Belfast, Northern Ireland. On the ferry, I watched Meet the Robinson’s, one of Pixar’s excellent movies. It is right up there with Despicable Me. After arriving in Belfast, I was able to experience the Christmas Markets around city hall and enjoy many hours of excellent shopping. As you can see, my previous trips to Ireland and Northern Ireland resulted in multiple forms of transit. Never though, did I ever rent a car and attempt to drive on the left hand side of the road, until November 2010. My mother must have been very trusting or scared for her life constantly. 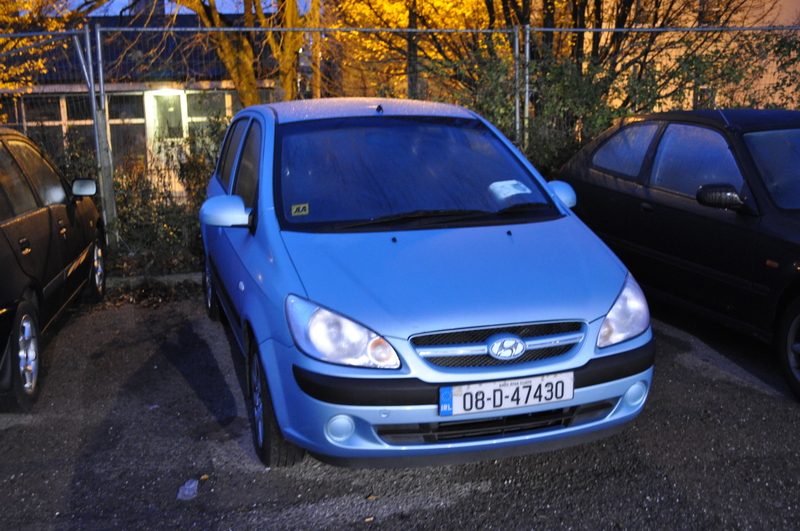 After we landed at the Cork airport, I picked up my rental car from the Budget Kiosk desk. After getting in and driving one car it had an incredible beeping noise that would not go away. I check all doors, windows, handbreak, but nothing seemed to stop it. 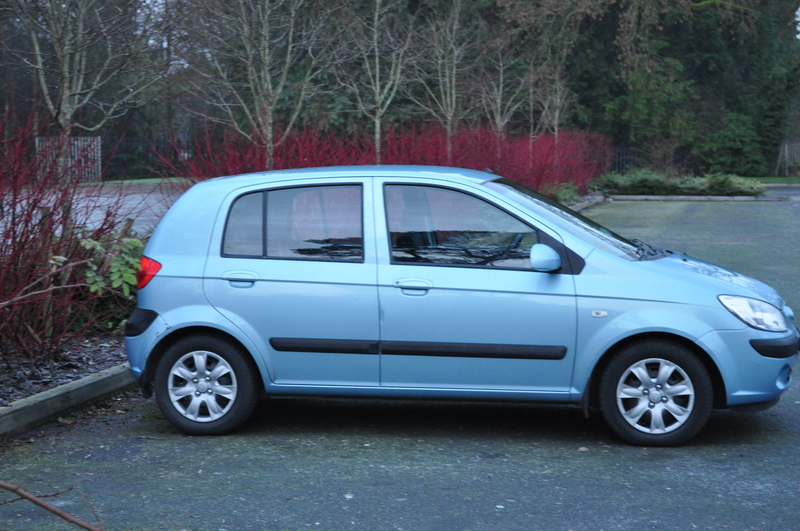 So back to the Kiosk and they exchanged my Nissan for a little Hyundai Getz. Our flight was delayed from Paris, coupled with the delay with changing the rental car pitted me in the second largest city in Ireland during rush hour traffic with no experience driving on the left. I have to say it was quite the daunting driving experience, but after getting parked that night each successive day seemed like a breeze. I love Ireland, it is like a second homecoming, as the beauty of the land reminds me of being in rural Newfoundland, only the grass in Ireland is Emerald Green, even in November. In 2007, I made multiple trips, but never really experienced Ireland, as I did not venture outside capital cities. Therefore, I decided it was important to see the countryside and the best way to achieve this was to rent a car, as it allowed me the freedom to explore the tiny villages and rural castles. Prior to leaving I downloaded maps on my GPS (Gertrude Prudence Spencer, I mean Global Positioning System) as I felt that getting use to the narrow roads, new landscape and driving on the left would be enough for me to manage without having to find my destination. It would have been almost impossible to manage without the GPS, driving as much time would have been lost trying to find locations. I enjoyed taking “roundabouts” (traffic circles), claiming to be “roundabout king”. I am sure though maybe I received a horn once or twice. The rural regions of Ireland are beautiful and the landscapes breathtaking. 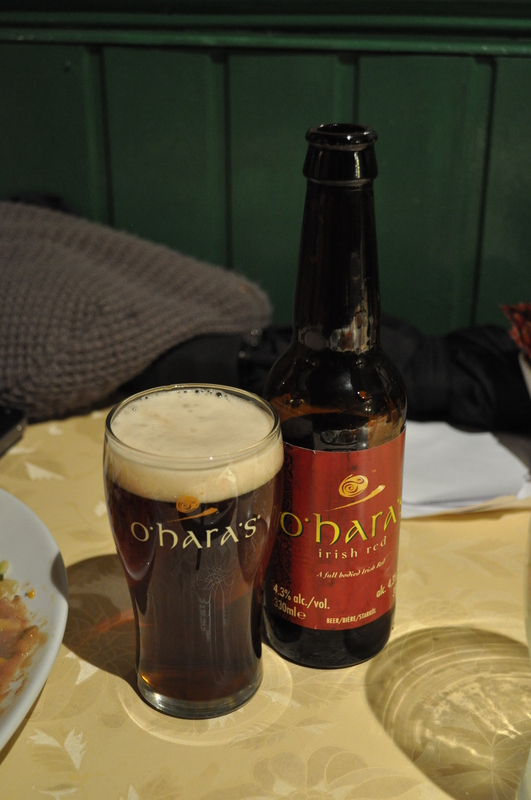 One does not have to look far to find why one would want to come to Ireland. For many of the same reasons, people flock to rural Newfoundland & Labrador.